Maker Faire is the Greatest Show (and Tell) on Earth—a family-friendly showcase of invention, creativity and resourcefulness… It’s a place where people show what they are making, and share what they are learning. The last Las Vegas Maker Faire attracted more than 1000 attendees with mostly word-of-mouth advertisement. We expect more this time because of our outreach to a wide variety of creative communities in the Las Vegas Valley. If you produce and create and perform, instead of only consuming products and media, you are indeed a Maker, whether you knew it or not! In the flagship San Francisco Bay Area Maker Faire, which attracts more than 100,000 people, the categories of Makers seems to grow exponentially every year. 2015 Faire was so big that that it was impossible to see everything over the weekend: besides electronics creations, there were crafters, gardeners, food producers, fashion designers, sculptors, artisan cosmetics creators, jewelry makers, bike and other mechanical device artists, performers… Really, there are more kinds of Makers than can be listed here. 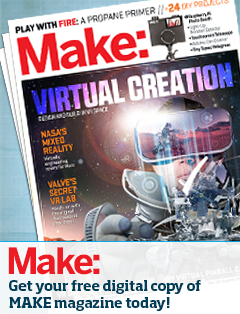 Can I sell my creations at the LV Maker Faire? Yes! Retails sales on site cost a one-time fee of $100. However, if you just want to show your work the booth is free. Pointing booth visitors to your retail website is also free. Just click on “Makers Apply Here” on the homepage and let us know what you’d like to do: sell on site for a one-time fee or show for free. Should I or my group/company/school participate? If you want to connect with creative communities in the Las Vegas Valley, you will be in good company at the Las Vegas Maker Faire. You’ll meet others who are excited about creating and doing and crafting and tinkering and performing. You’ll get ideas for your next projects by meeting others with similar or radically different, but fascinating, ideas and creations. You can cross-fertilize and innovate, and make some new, interesting friends. You can expand who is aware of what you are passionate about. If you want to sell your creations or products, the Maker Faire is an event that attracts locals and tourists who appreciate human-made products and are looking for alternatives to the mass-produced. If you want to show or sell your creations or products, or want to perform or give a talk click on “Makers Apply Here” on the homepage and fill out the short application. If you want to meet the creative communities coming out the woodwork at the Las Vegas Maker Faire, come to the Faire, or sign up as a volunteer by emailing us. See the “Contact” page. What makes a great booth/station/table ? Activities! If you have at least one hands-on activity, people will crowd around your booth. The Maker Movement is about learning as much as creating, and people attracted to Maker Faires tend to love learning something new. Is there free parking? Will load-in and load-out be easy? The load-in and load-out area and free, ample parking is steps away from where you’ll be exhibiting or performing. What is the timing of the event? These are approximate times that will be refined as we get closer to the event: Load-in will be approximately between 7 and 10 am, a soft opening at around 11 am, and general open doors between 12 noon and 6 pm.